Official Summary: You can add the book and find the summary on Goodreads. I don’t want to ruin too much if you haven’t read any of this series. This is the fourth in the series. Review: If you’ve been paying attention, you know that I love this series. It’s a mystery series with an m/m romance, but if you aren’t a big romance person, don’t worry! I think this series does a good job mixing the mystery and romance so that neither really overpower the other. 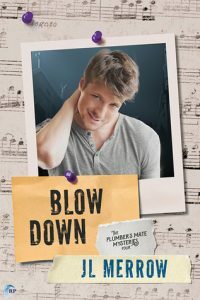 Blow Down is the fourth book in the series, and each one follows the same characters, so it’s probably a good idea to start with the first book. I’m sure you’ll fall in love with Tom and Phil like I have! Tom is a plumber, but he also has a gift for finding things. I was asked after my last review if this was a power or just something he’s good at it, so I want to clarify that it’s a power. He can sense really strong emotions and if something has been purposely hidden, he can follow the tracks of that emotion toward the item. He usually has to be focusing on finding something though; otherwise he’s not likely to notice. As for Phil, that’s Tom’s private investigator boyfriend. Tom and Phil are often teaming up in these books because Phil can usually use Tom’s power to help them solve the mystery. Each book in the series has its own separate mystery, which is fun, but it also progresses the relationship of Tom and Phil, which I love! Definitely give these a shot! I love when books have a touch of the supernatural that doesn’t overpower the story. It sounds like this is right up my alley. Thanks for the summary! This book sounds very interesting! I love a good romance, and with a little mystery thrown in you can’t go wrong! Tom sounds a little like Shawn from Psych but in a more supernatural way. It sounds like he and Phil make a great team! That’s a good comparison, and I do LOVE Shawn. I have this series on my list. I love series that follow the same couple. it’s great to see that all the novels are great! Tom the plumber again. 🙂 I actually love romance books and if there is a little mystery mixed in, that makes it even better! Hi there! I love mysteries. I may check out this read after your review. I would also suggest some mysteries written by John Connolly. You might fancy. This sounds like a really nice blend of genres. I am actually a little more intrigued now that I know that he has a special power. Great review! I like that it sounds like the books in this series have a nice balance between the romance and other aspects of the story. I don’t mind romance in books as long as there are plenty of other things going on. I also like when genres are blended. I had not heard of this series. I may check them out when I get through my stack that I am currently reading. These mysteries always sound good and I love that you continue to enjoy the series, Lauren. Hey! We’re on the same wave length still. My review goes up on Thursday. I like that there is a good mix of other genres going on in this book as I am not a huge fan of just romance alone. I like that there is mystery in it as well. I didn’t know that this was part of a series and as usual, I like to start series out with the first! I’m such a picky person that way! I hadn’t heard of this series before but I will definitely try it.